What do you prefer, outdoor wedding or indoor wedding? Some people definitely prefer outside wedding because of fresh air, sun and green trees and flowers around. Others prefer inside wedding, they don’t like bugs and hate to be hot. But many think that outside wedding such as home garden wedding or beach wedding is an amazing thing. Outside weddings are beautiful, scenic, romantic and unforgettable. Planning a beach wedding can come with its downsides as well its upsides. Let’s discuss some of the things you need to keep in mind when planning a perfect wedding ceremony at the beach. You must always keep in mind that the weather may or may not cooperate, so you will have to plan for beach wedding an alternate way if the latter should happen. You have to plan everything ahead of time, as you will want the least amount of problems. Your options will be in this case either an alternate ceremony site or renting a tent as a backup, should the weather decide to take a turn for the worse. Keep an alternate wedding location in mind and inquire if it will be available on a short notice. You may have to take this route if the weather should refuse to cooperate. You will want your guests to be comfortable and not have to worry with fighting the elements when trying to enjoy your special day with you. You can still have the airy open atmosphere of a wedding at the beach, of being outside at the ocean shore while you and your guests stay shielded from the elements if you rent a tent. A small tent could be rented for a minimum one hundred fifty dollars to a six thousand square foot size tent renting for around four thousand dollars. The latter is quite pricey but will have the capability to hold your party as well as the catering and its staff, so it may be feasible to rent it. When sending out the invitations, do not forget to include instructions for your guests in case of a bad weather. Planning early can secure your chances of having the desired location for the ceremony and any amenities need for it or for your guests that will be attending. A tent rental serves many more purposes than just shielding your guest. A tent can house a dance floor for your guests and house a seating area. Senior guests will appreciate this and the tent will offer a welcome reprise from the harsh summer sun. Bouquets and bottled water will be a nice gesture also. Flooring and seating can usually be arranged by the tent rental company and can be beneficially for a sandy floor setting. Beach weddings are fast becoming more and more popular and in choosing this setting for your special day, one has to plan it thoughtfully. One must make sure of the rules and regulations when opting to rent a tent such as candle burning, or how loud the music can be played and if there are any rules on the number of guests that a tent can accommodate. Be sure and check out the rules and stipulations before hand, so you will not be disappointed at the last minute. A beach wedding however, is usually opted for when the bride and groom only want to have a small tight knit group of loved ones and friends as compared to the large church setting invitation. 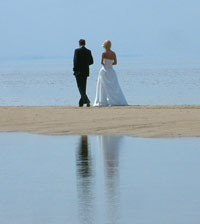 A beach wedding also has a down-scaled after ceremony party as compared to the usual after wedding reception. A beach wedding will let you keep almost all aspects of it simple and you will find it will eliminate a lot of the headaches associated with planning a larger wedding. Read more about planning a wedding on our special site. Beach wedding theme allows you a great creative freedom. You can choose different mood of your beach wedding depending on the time of the day – sunset, sunrise or midday. And nature gives to you a lot of natural decorations: flowers, sand, sun and sea. Bright beach wedding theme includes such items as exotic tropical flowers in your bouquets, elegant white beach wedding dress, traditional Black Rum Wedding Cake and celebration till late night. Hawaiian beach wedding theme can be very romantic. Hawaiian guitars, bright multi-colored Hawaiian style sundresses, shirts and skirts, beautiful nature will make your special wedding day unforgettable. Be an actor in your own theater. Just play, this is your special day. Bride and groom can have a Pirate Wedding, Cinderella wedding, Western wedding themes and such. If you like animals such as mermaid, dolphins, turtles etc., You can have a great beach wedding theme based on the sea and fantastic creatures. Choose necessary wedding attire like dress in mermaid style or a fishing net with sea shells. There are literally thousands of beach locations and beach themes one can choose, if a beach wedding is what you and your significant other want. There are many US locations as well as international. Take into account if there is lodging near the site if guests have to be housed during the time around the ceremony. Try and select a time and date that is off season for the beach and it’s area. This will keep the congestion of tourists and visitors to the area at a minimum and possibly make for a better wedding on the beach. Also one may acquire discounts on some beach wedding services if they are purchased in an off season as compared to high seasonal times. Island weddings are also becoming more and more popular. Everything in your wedding ceremony and the wedding party may need is included in the package. These wedding packages make an island wedding theme more economical than one may think. All the travel to and from the island and lodging of you and your guest can be arranged and included in the package. You may have a nice Caribbean wedding, wonderful island wedding on Hawaii, beautiful wedding on islands of Thailand, coral Maldives islands, island wedding on amazing Seychelles or even in Australia’s tropical north Magnetic island. Everyone must remember a few tips in order to have a memorable and beautiful wedding on the beach. First, keep your beach wedding planned in an area that is accessible to all on the beach. Sand can make it hard to keep ones footing sometimes, so looking for a flat grassy area near the beach can make more sense for the ceremony site. The portraits on the sandy part of the beach you so desire to have taken, can still be taken after the ceremony. Another tip is to keeping your wedding attire and the attire of your wedding party informal and comfortable. This may be what is needed to have a memorable and ideal, perfect beach wedding. You can read about beach wedding dresses on the next page. Casual is a key. It is alright to request that guests wear comfortable shoes and attire and let them know ahead of time if possible of the projected weather for the glorious day if you can. Bride and groom will want to wear clothing for the reception that is just as appropriate and comfortable as their clothing was for the ceremony. If it is chilly you may also want to remember to purchase a cover up or shawl. Beach weather is unpredictable and you can never be over prepared. You must also think of scheduling the ceremony more toward the morning or evening hours. This will be a much smarter choice because the sand can get very hot if you are opting for you and your guests to walk onto the sand for the wedding ceremony. You may have burns occurring on a regular basis. Flips flops may be more the thing for you and your guests in the case of the sand having sharp shells or objects in it. Also, the sun may cause a glare at a particular time of day and that may not make for great portraits plus, everyone will be squinting at one another. So plan ahead! Be sure and allow for the ceremony time to be set during low tides, as this will keep the wave noise to a minimum. You will want to be sure that your guests can hear your vows. Keep bug and pests in check with citronella candles or ask that your guests apply themselves with a repellent in the event of pest invasion. And, last but not least, be sure and get the needed permission from the county clerk’s office, before you have settled on any one location. Be ready to pay a fee if one is needed and the office will also be able to supply you with the much needed information on rules and regulations, so your beach wedding or island wedding can be a great success and perfect wedding! Definitely, after perfect beach wedding should be an ideal and memorable honeymoon vacation. You can read about honeymoons on the next article. Maui beach wedding can be a dream wedding for many but only few make it reality. 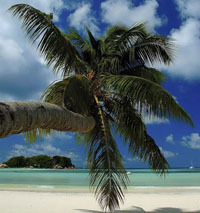 The beaches are the perfect wedding destination and most people consider it very expensive and difficult to arrange. However, a little bit of research is what required to organize and perform the affordable and a lifetime experience. There are umpteen numbers of beaches and one would be confused to select a particular beach. 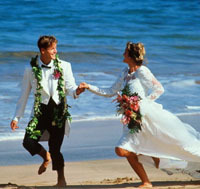 Most of the weddings take place in West Maui on the sands of Ka’anapali, Kahana, Kapalua, Napili, and Lahaina. South Maui beaches constitute great wedding spots on the sands of Wailea, Kihei, Makena, and Ma’alaea. The South Maui beaches are preferred over the other destinations because of the less rainfall received in this area.